The credit sequence of Twin Peaks: The Return begins with the familiar school portrait of Laura Palmer superimposed on the waterfall near the Great Northern Hotel. However, unlike the earlier seasons, when we see the flowing cascade from a distance, we now watch from above as the water gushes into a chasm. This minor distinction points to the elegant larger transformation that David Lynch and Mark Frost have engineered in their formerly endearing, but now horrifyingly obtuse, television show. In its first two seasons, Twin Peaks was, like Lynch’s Blue Velvet (1986) before it, remarkably focused on life in the Northwest United States, where Lynch spent his childhood. Born in Missoula, Montana, Lynch went to art school in Philadelphia and then moved to Los Angeles to make his experimental first feature, Eraserhead (1977). Replicating his biography, Lynch’s recent films have careened toward a larger geography: The Straight Story is about a man who drives a lawnmower across the Midwest, and, most significantly, Mulholland Drive (2001) and Inland Empire (2006) are among the best films ever made about the misery of Los Angeles. Blue Velvet and the first two seasons of Twin Peaks represent what happens when the horrors of the larger world come calling in a seemingly tranquil Northwest town. The crass FBI agent, Albert Rosenfeld insults the locals for their country bumpkin ways. Even the mythological aspects of the show seemed centripetal, spiraling toward the specificity of the American Northwest. The show almost never left Twin Peaks, obsessing on the varying locations within a few miles of the center of town: the Double R Diner, the Twin Peaks police station, the Palmer residence, even One-Eyed Jacks, the bordello just a few miles away across the border into Canada. The very name of the locus of evil in the show’s mythology, the Black Lodge, invokes Native American lore, situating the horrible acts we witness in a local, rather than global frame. Perhaps the most violent sequence in the entire first run of the show is when Bob as Leland Palmer murders Laura’s look-alike cousin, Maddy by smashing her head into a glass picture frame of a bucolic portrait of the Rocky Mountain West. Bob screams, “Leland says you’re going back to Missoula, Montana” as if the journey from Twin Peaks to Lynch’s boyhood home were the entirety of the known world. And yet, the larger reach of the show always lurked in the background, now fully exposed by Twin Peaks: The Return. 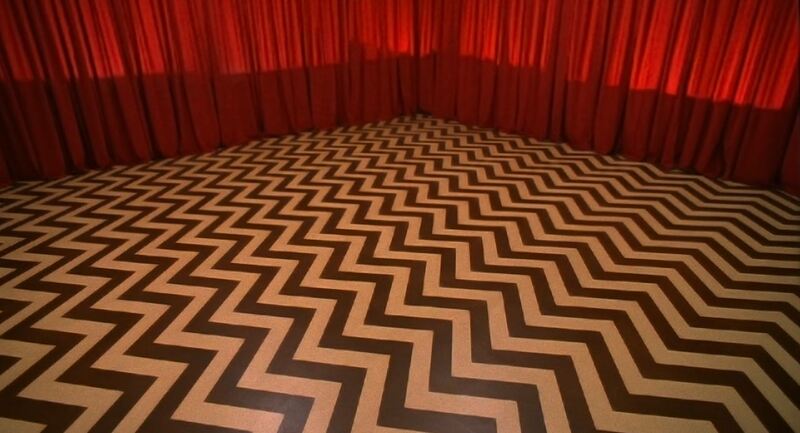 The visual design of the Black Lodge foregrounds a flowing, deep red curtain. The floor features a zig-zag pattern of sharp broken brown and white lines on an art deco linoleum floor. 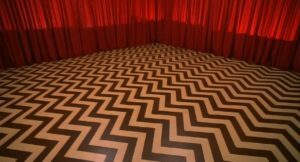 The Black Lodge, as the production team’s design presents it, emphasizes the theatrical. The graphic design of the floor’s pattern is inspired by Native American art, but, like The Shining before it, points toward the inherent violence of the national American character. In Twin Peaks, the curtain and floor of the Black Lodge serve as theatrical set pieces, first for dancing dwarves, and now mysteriously talking trees with throbbing brains. Twin Peaks: The Return has disposed almost entirely of the town Twin Peaks itself. As a deliberate interruption of the main plots, Lynch cuts back to the show’s titular foundation, but mostly this new show is a mesmerizingly centrifugal story, allegorized by the new credit sequence. The original story of Laura Palmer’s murder by the mythical Bob floats above all that we see, but the show quickly sweeps us past what we used to care about, inevitably and unavoidably flowing away from the town. The new show sends us over an abyss toward an alien portal in New York City, another unsolved murder in South Dakota, and oddly terrorized gangsters arranging hits in Las Vegas. At the end of episode 5, “Case Files,” the now global focus of the show is fully revealed. In Buenos Aires, we see a black box with two red lights sitting in a bowl. When the lights turn on, the box transforms into a small piece of metal. What this may mean is anybody’s guess. Agent Cooper is no help: with total amnesia in Las Vegas, and everyone thinking his name is Donnie, our hero holds files he has no idea what to do with, instead mesmerized by a statue. The Argentine black box is as clear a metaphor as the show has produced thus far: Lynch has engineered an alchemical transformation, extending his quirky show about the American Northwest into an epic science-fiction interrogation of the global despair engulfing us all.